The firm’s Steven Siegfried and Jason Rodgers-Da Cruz recently had the honor of co-authoring a chapter (Chapter 4) for the American Bar Association’s new Construction Defects legal manual, which is available for purchase from the ABA by clicking here. The 384-page manual provides an analytical guide to construction defect law throughout the United States. 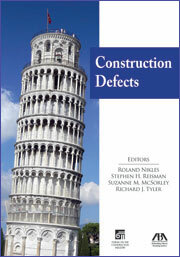 It covers key issues in the law and serves as a complete frame of reference for any construction defect case. Chapter 4, titled Statutes of Limitation and Repose, reviews cases from multiple jurisdictions and applies the statutes of limitations and repose to various scenarios that a practitioner may encounter. Congratulations to Steven and Jason on being selected by the American Bar Association to serve as contributing writers for this legal manual.